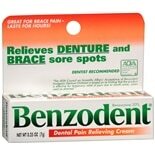 Benzodent Dental Pain Relievi....25 oz. Great for Brace Pain - Lasts for Hours! 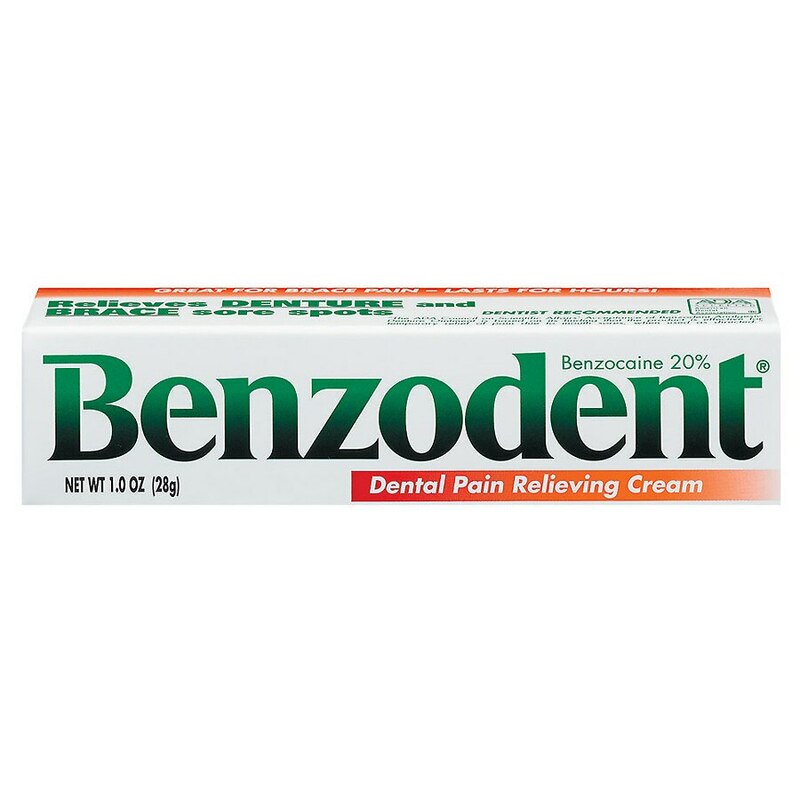 "The ADA® Council on Scientific Affairs' Acceptance of Benzodent® Analgesic Denture Ointment is based on its finding that the product is effective for temporary relief of pain due to mouth sores, when sued as directed." Adults and children 2 years and over: Remove cap, break metal seal with cap point. Apply directly to the gums or to denture surface that comes in contact with the affected area of the gums. If you are using with dentures, wait a few minutes then reinsert dentures and yo may use your regular denture adhesive with this product. Use up to 4 times daily or as directed by a dentist or doctor. Children under 12 years of age should be supervised in the use of this product. Children under 2 years: consult a dentist or doctor. Allergy alert: Do not use if you have a history of allergy to local anesthetics such as procaine, butacaine, benzocaine, or other "caine" anesthetics. Localized allergic reactions may occur after prolonged or repeated use. Do not use for more than 7 consecutive days unless directed by a dentist or a doctor. When using this product: Avoid contact with eyes; do not exceed recommended dosage. Stop use and ask a doctor or dentist if: Sore mouth symptoms do not improve in 7 days; swelling, rash or fever develops; irritation, pain or redness persists or worsens. Keep out of reach of children. If more than used for pain is accidentally swallowed, get medical help or contact a Poison Control Center right away. For temporary relief from pain and discomfort of irritations caused by dentures. 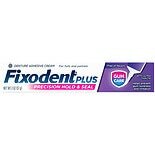 Fixodent Plus Gum Care Superi...2 oz.